At a recent event, senior learning leaders explored the pressures and opportunities facing corporate learning, including the importance of developing a learning culture that’s aligned with business strategy and goals, the opportunities presented by emerging learning technologies, and how L&D can create learner-centric experiences. The roundtable, hosted at the grand opening of SkillPath’s new Center for Professional Development in Mission, Kansas, included Fay Balk, HR director for organizational effectiveness at Hallmark; Barb Schlittenhard, director of learning and development at Sprint; and Dave Fogleman, chief learning officer at SkillPath. The roundtable was moderated by Training Industry’s Scott Rutherford, following an introductory presentation on learning trends for 2019. The roundtable discussion focused on several important topics in learning and development, including strategic alignment, demonstrating value to the C-suite, the learning experience, gamification, emerging technologies like virtual and augmented reality (VR/AR) and artificial intelligence, using training to manage risk, and opportunities for learning leaders. “Alignment is a magical word,” said Fogleman. L&D should be aligned not only with overall business goals but also with each component of the “talent system,” including hiring, performance management, rewards, etc. Once that alignment is in place, you can start building a learning culture, and business leaders start to realize the importance of people strategy. L&D needs a strategic plan in order to be an influencer instead of having a strategy mandated to them by the C-suite. Developing a learning culture is key to a successful business. Rutherford noted that in 2018, there was a significant conversation around the “learning experience” – what it means to provide a good learning experience, how technology supports a good experience and even the emergence of the learning experience platform. Training Industry research last year found a correlation between using the learner’s preferred modalities and the learner’s perception of training effectiveness. How can organizations map those relationships and make a more effective learning experience? There’s a lot of really great technology, Schlittenhard said, but we can’t lose sight of what’s best for each learner. Broadly speaking, learners want flexibility and multiple modalities, creating a responsibility for L&D to create a good learning experience. There’s a lot of really great technology, but we can’t lose sight of what’s best for each learner. “It’s balancing the efficiency of ‘one-size-fits-all’” with what will actually be effective, Balk added. At Hallmark, the HR organization is using more human-centered design, and she says this type of design will also make the learning experience more effective going forward. Human-centered design is an approach in which designers begin with their audience or users in mind and create a solution based on a thorough understanding of their needs. An example of a human-centered design technique is design thinking, which is increasingly used in instructional design and training development and focuses on user experience. Steve Jobs started with the user experience and worked backward from that to create Apple products, said Fogleman, and training designers should do the same. User-centered instructional design can create personalization at the point of need and help organizations move from blended learning to seamlessly blended learning experiences. When it comes to gamification, said Schlittenhard, “We’re dipping our toe in,” and it’s important for L&D to understand when to use gamification and when not to use gamification. For example, when learners are intrinsically motivated, gamified programs with rewards and incentives will likely not be an effective approach. Schlittenhard said that she previously bought some VR goggles, “but it was clunky, and the tech just wasn’t there.” It’s advancing, however, and Sprint started using AR in its product training for retail employees and customers last year. The company is also working on a solution to provide virtual assistance from techs to workers when they are in the field. On the other hand, says Balk, “our baseline technology is already challenged, and so we’re working on getting that up to snuff … before we look into AR/VR.” She sees the potential of artificial intelligence (AI) to increase learners’ speed to proficiency but added that when using emerging technologies, it’s important to “make it not just something that’s fun and cool” but where the content is actually effective. AR applications in training are “just phenomenal,” said Fogleman, especially in industries that are dangerous or where mistakes are expensive. As an example, an audience member said that a Kansas City engineering firm is using AR to teach employees how to de-ice plains. Fogleman believes that as AR and VR become more cost-effective, organizations will increasingly use them in soft skills training as well. When it comes to risk management, recent Training Industry, Inc. research (coming out this month) found that learning and development can play a key role. In his “Trends” presentation, Rutherford pointed out that training must be proactive and strategic rather than reactive, and panelists agreed. When it comes to risk management, learning and development can play a key role. “Always, there are opportunities to do more,” said Schlittenhard. She recommended partnering with the corporate communications team and “always directing [employees] back to resources and tools.” Proactive training and annual compliance training (using microlearning and “vignettes” to make it engaging) are important, but so is “keeping the conversation going throughout the year.” As an example, Sprint conducted a “Ways We Work” campaign last year to help managers have conversations with their employees about topics such as productivity and building trust. When it comes to unconscious bias training, Balk pointed out that the “research is kind of 50/50” as to whether it’s effective. She said what’s important is to create an inclusive culture, which starts with the CEO and continues with encouraging inclusive team building rather than mandates. Risk management “is actually a big opportunity for your company,” said Fogleman. “These social trends and new social awareness [are] a really big opportunity to change your whole culture.” It’s important to understand the cognitive science behind such risks as unconscious bias, he added. “Is innovation to mitigate risk too risky?” asked an audience member via the livestream. While the content must be serious by nature, Balk said, you can innovate its delivery. Partner with your communications or legal teams – they can provide the content, and you can make it engaging. “What are the most significant opportunities for your training organization?” asked Rutherford to wrap up the panel discussion. Schlittenhard identified two opportunities for Sprint. The first was in learning technologies: “How can we stitch an ecosystem together with all the technology, that will work with a diverse learning audience?” The second is “the continual innovation” of learning content. At Hallmark, Balk said, she and her team are continuing to improve their leadership framework and embed it into development programs and throughout the talent system. They are also working on “leapfrogging” into technology to provide “just-in-time, personalized” training. With that, the panel closed, and the SkillPath Professional Development Center was officially open for business. The new center is part of SkillPath’s goal to make Kansas City a hub for professional development, according to Cam Bishop, president and CEO of SkillPath. Indeed, learning leaders from many local businesses attended the event in person, while others watched it via livestream (it was, after all, a snowy day). 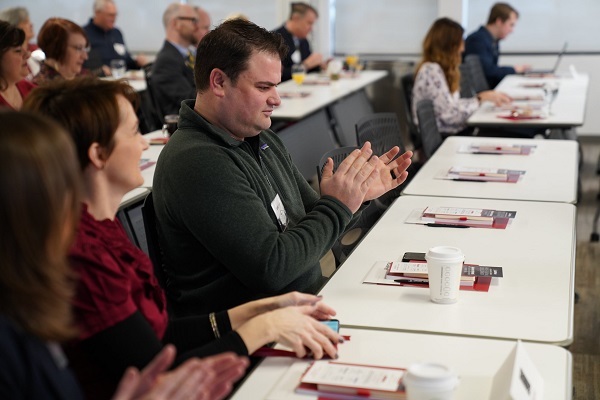 As it partners with local businesses to provide lifelong learning to Kansas City professionals, these opportunities – and more – will continue to change corporate training and the trajectory of learning. The new center is part of SkillPath’s goal to make Kansas City a hub for professional development.